The heat generated by an outdoor patio heater is much like the heat you feel being produced by the sun. Whether you're using an infrared heater inside or outdoors, the heat is easily absorbed by the objects and people it touches. It comfortably raises the ambient temperature in both indoor and outdoor settings by heating cool surfaces. Which makes infrared heaters perfect for any occasion where comfort is important. When purchasing a patio heater, you, of course, want to make sure it is safe to use. One of the most notable benefits of these heaters is that their core temperature doesn't get as high as the core temperature of a conventional heater. To further enhance the safety of an infrared patio heater, a protective metal sheath is used to cover the heating elements. As always, make sure to read the owner's manual for your heater, and adhere to it's safety guidelines. Depending on the outdoor patio heater you purchase, you may be able to easily use it in various locations. 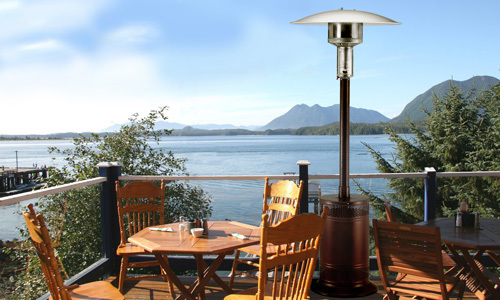 Some patio heaters, like Sunglo and Patio Comfort heaters, are portable. This means you can place them according to your own preferences. If the cocktail party moves from the patio area to the front yard, you can easily roll the portable heaters around front to keep your guests nice and warm. If preferred, you can even hang them from the ceiling of a covered patio or secure them to the ground using a free-standing pole. Infratech and Sunpak heaters can also be installed on the ceiling or on a pole, but they come with the advantage of being able to be attached to walls too. If you're looking for heaters that can be installed flush with the ceiling or wall, these two heater choices are sure to suit this preference. And on the Infratech heater, you'll enjoy an assortment of switches and heat regulators to control the heater's temperature, including a heater duplex switch. 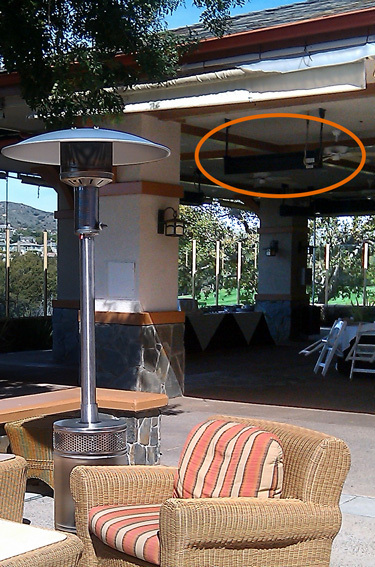 The radiant heat emitted from patio infrared heaters radiate outward and create a widespread heating effect. If you are hosting a last-minute get-together, you can power on the patio heaters and you'll have instant heat to keep you and your guests warm. The heaters provide this heat to the objects and people directly in their pathways instead of heating the actual air, which wastes heat and energy. Patio heaters take advantage of zone heating. Instead of working to heat the entire outside area of your home, they work to heat the objects that are closest to them. When installing the heaters on the wall or suspended from the ceiling, they will instantly heat the room or nearby area in which they are installed. This can save an enormous of energy, which reduces your heating expenses. In fact, it is possible to save as much as 30 to 50 percent on heating bills. When compared to conventional heaters, portable outdoor infrared heaters use a significantly lower amount of energy to produce the same amount of heat. Some Infratech and Sunpak heaters can provide heat with as little as 300 watts of electricity. They use reflective metal to transfer nearly 100 percent of the heat they produce. And since there's no need to power the heaters on and wait for them to heat a room, you can, instead, use them on an as-needed basis, which further optimizes energy efficiency. The infrared rays produced by patio heaters are completely harmless. They are far more effective at heating than a fire pit and boast numerous safety advantages. You'll be able to choose between three power sources -- propane, natural gas, or electricity. Our portable heaters are extremely convenient and allow you to save space when they aren't in use. If you're looking for a safe and convenient way to provide warmth to outdoor patio areas, contact us today to learn more about our vast selection of portable outside infrared heaters.